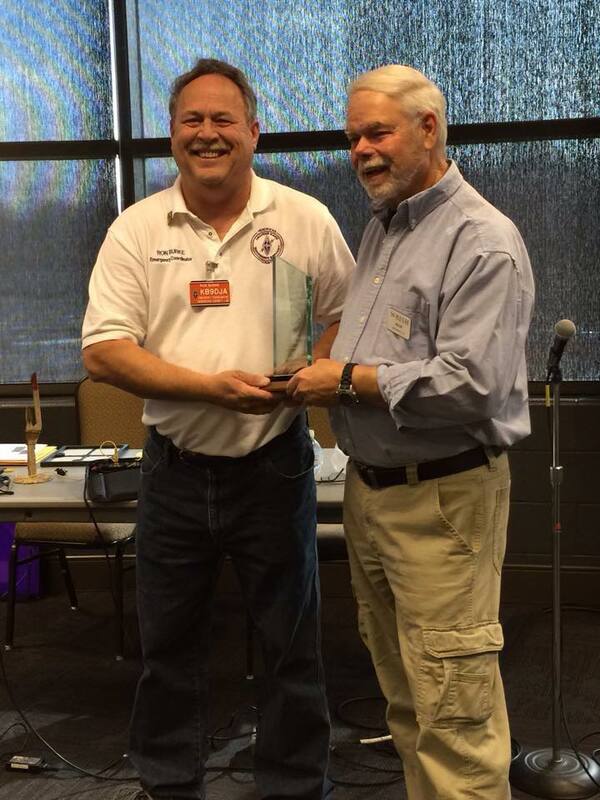 Ron Burke, KB9DJA, IRCC Outstanding Amateur of the Year award recipient for 2014. You can click HERE for a picture of the award presentation. Click HERE for a close-up image of the award. Congratulations Ron ! 1) The next Hendricks County ARES Hospital Net, will be on April 20th. The Net will start at 10:30am with John Farmer, N9CQ, hosting from Hendricks Regional Health Hospital. He will be using 147.570MHz simplex. This Net is to check the capability and performance of our radios with a Net Control Station as well as other Hams in and around Hendricks County, during an Emergency and/or Disaster. The Net does not take long, so please join us during this important exercise. 2) Hendricks County ARES will be conducting a training class on the set-up and operation of Portable Integrated Gear (PIG) on Saturday April 27th from 1pm to 3pm at the Hendricks County Senior Services Building located at 1201 Sycamore Lane, Danville (Right behind the Hendricks Regional Hospital). 3) The North Central Indiana Hamfest, sponsored by the Grant, Miami, Cass, and Kokomo County’s ARC. It will be on April 27th at the Miami County 4-H Fairgrounds, located at 1029 West 200 North in Peru Indiana. Talk-in will be on 147.345MHz with a sub-audible tone of 131.8Hz. For information contact Stephen Shepler, WA9RVM, at 765-661-5260, or email to shepler1@gmail.com. Or go to their website at http://www.nci-hamfest.net. 4) The Hendricks County ARES QSY nets will begin in May. The QSY nets will run from May to October. These nets are run during the weekly ARES net to check the ability to QSY to another frequency. If anyone is interested in helping out running a QSY net, please contact Verne Madden at 317-418-4424 or at n9vam@sbcglobal.net. • There were no additional on-air announcements this week. • The various meetings and nets mentioned above are all training opportunities. Please participate in as many as possible. Your business can support Amateur Radio too ! We display our business supporter's logo and a link to their website. This website is best viewed in FireFox browsers. Hospital Radio Nets are on 147.570 MHz simplex at 10:30am, the 3rd Saturday of each month, EXCEPT November and December.. All Hams are invited to participate. This website can be viewed on a mobile device? Just "pinch & zoom" to enlarge content and "swipe" to navigate the pages. When viewing on a desktop or laptop computer, hold down the <CTRL> key and press the + or - keys to zoom in or out. Use the + & - keys just below the function keys. Pressing <CTRL>0 returns the screen back to the default size. Flyer Group newspaper about the Feb 14th Brownsburg Hamfest. You can check it out in the printed version, or click HERE for the on-line version. American Legion magazine, March edition page 32. You can access the article by ckicking HERE.